A 17-year-old boy has died after he was found with a gunshot wound in south London, police have said. Rhyhiem Ainsworth Barton was discovered in Warham Street, Southwark, after reports of a shooting in nearby Cooks Road, at about 18:05 BST on Saturday. The teenager, described as a “good boy” by his mother, was given first aid by doctors and ambulance crews but was pronounced dead at 18:56. No arrests have been made and the Met said inquiries are continuing. 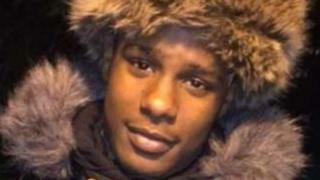 Rhyhiem’s mother Pretana Morgan told reporters on the estate: “I couldn’t have asked for a better son. The Met is appealing for witnesses. More than 60 people have been killed in the capital this year – about half were the result of stabbings. London mayor Sadiq Khan said his thoughts go out to the “loved ones of the teenager who was tragically killed”. In a separate incident, a cyclist was shot at in Blenheim Grove in Peckham but the gunman missed hitting shop shutters at about 23:20 on Friday. Three men then made off on two mopeds.